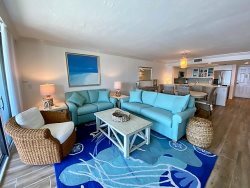 You may have found this rental on HomeAway #4808382 , VRBO #4808382ha or Vacation Rentals #4808382. If this is even a negative this is what I have, the lawn maintenance crew got started just s bit early with the weed eater and leaf blower. Very cordial and responsive to all inquiries. Our stay was the fourth at your facility and it was excellent as usual. Cordial and helpful staff, well maintained facility, pool and property in excellent order and located in a scenic & highly desired area. Nice Condo, little bit old fashioned decoration/interior. Great viewes on Gulf and nice pool, good location Publix and walmart nearby. Be ware of no-see-ums.